← Ashes to ashes, parent to child. I may not have bats in the belfry, but I do have a squirrel in the attic. At least, I hope it’s only one. Good grief. We first noticed it ages ago, but it took us a few weeks to find a pest control company who would help us for a reasonable price (who knew squirrel-catching was such a lucrative profession?). Finally, we found a really nice guy with a really nice price. He was local. He came right away. My new friend S. came and installed a one-way door where the critter had been getting in. He charged us $300 and told us he’d be back in a few weeks to collect his hardware. He was sure we wouldn’t see the squirrel again, and he was right. For awhile. Last night, the squirrels woke me up sometime around four am. I was not happy. The soft sound of scratching isn’t as bad as say, a train horn or bagpipes at that hour of the day. But laying in bed listening to the varying patterns of scritching and scratching can induce a fair amount of worry. Are they making a nest to have their spring litter above my bedroom? Is my house gong to burn down because they are chewing on the wiring? And what kind of a smelly mess are they making in my attic? Thankfully I dozed off again in fitful sleep and the sound was gone when I got up this morning. Then I sat down at my desk. Rustle, rustle. Thud. Scratch scratch scratch. Arg! I looked around for something long enough to reach the ceiling, but there were no brooms or mops handy (not an unusual situation for my household, really). So I picked up a wooden chair, turned it upside down and banged the legs on the ceiling. He scampered. I banged some more. Scamper. Bang! Scamper. Bang! The scampering headed for the eaves trough. Bang bang bang! Silence. Victory! It was short lived. Just as I settled in to finally check my email, I heard it again: scratch, scratch. So I whipped out my trusty chair and banged him away again. Take that, you nasty squirrel! 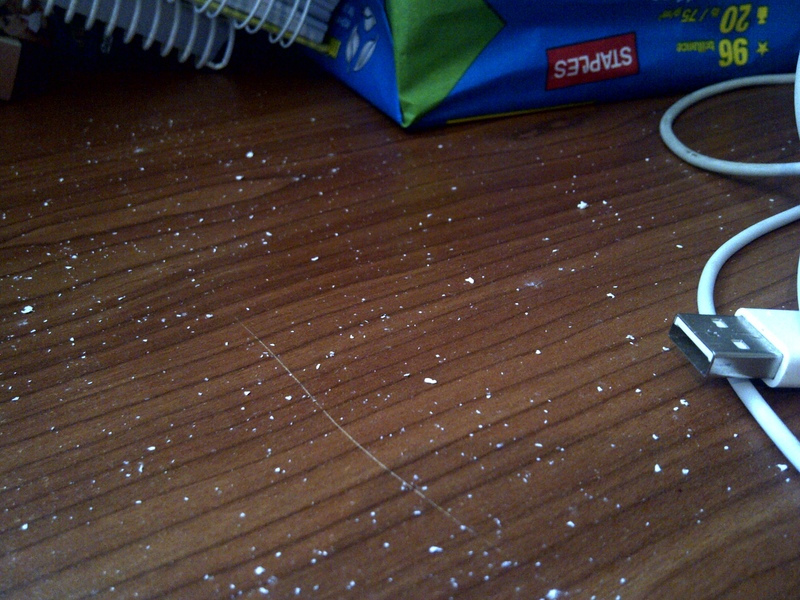 The light dusting of plaster that now rests on my desk notwithstanding, I am feeling like a successful squirrel wrangler. My husband, however, (who is at work and hates the thought of my banging willy-nilly on the ceiling all day long) has agreed to call our friend S. again. Perhaps he needs to come back and check on his “one-way” door. It’s funny to me that I spend the rest of my life trying to open doors: the door to my house so I can offer hospitality to family and friends, the door to my church where I hope all will find a warm welcome, and even the door to my heart where I might receive the love of God. But now here I am hoping for the permanent closure of that tiny, one-way squirrel door. Knowing that every single one of us longs to be loved, welcomed and accepted, I almost feel sorry for that poor little squirrel I am evicting. Almost. Because while all God’s critters may have a place in the choir, they still don’t belong in my attic. 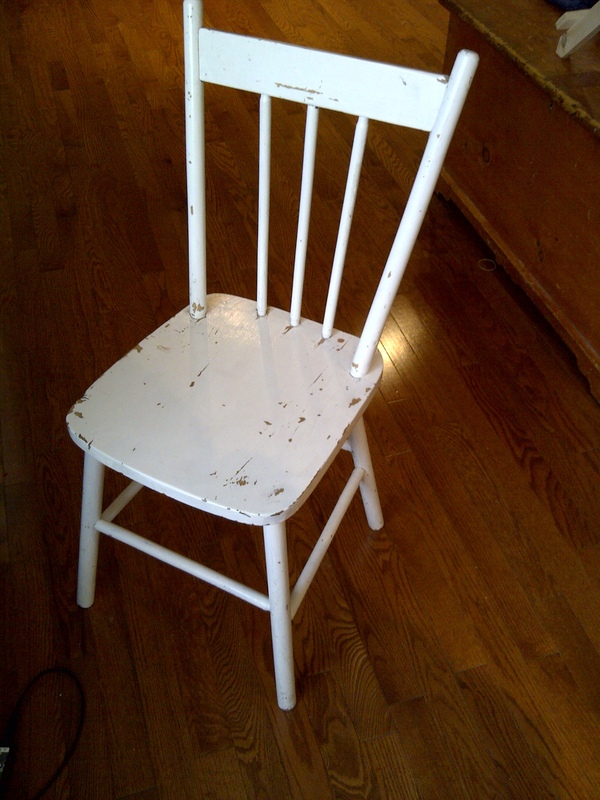 Which is why, at least until S. gets here, I am keeping my trusty white chair at the ready. This entry was posted in Uncategorized and tagged backyard, nature, trouble. Bookmark the permalink.